After the snowstorm yesterday, which was unexpected and a bit late in the season, all eyes are now on spring and summer. I'm looking forward to it. Here's some photos from summer, from last year. 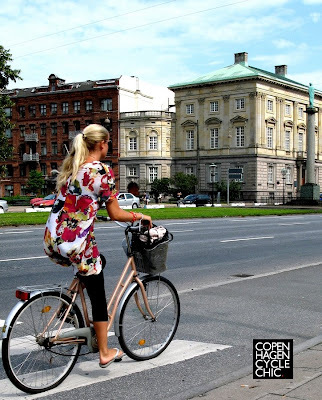 And this photo - below - is by far the most popular in the Copenhagen Cycle Chic archives. I've entered it in a competition over at JPG MAGAZINE - cast a vote for it - and bike culture - if you have the time. It's in the Human Impact category. Can't argue with bikes making impact on humans. And certain cyclists making impact on others. The funny thing about this shot was that I was out riding to the supermarket with Wifealiciousness. We were at a red light and she elbowed me and said, "Camera... get your camera out..." I did, just in time. 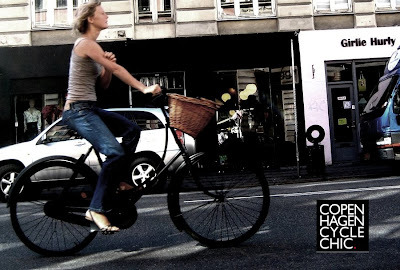 The very best advocate for cycle chic swept past.